I’m all for spending a little extra time in bed, I can clearly remember my early morning pleas of “just five more minutes Dad?” each morning before school. How heavenly it is to know that you have full permission to hit the snooze button. 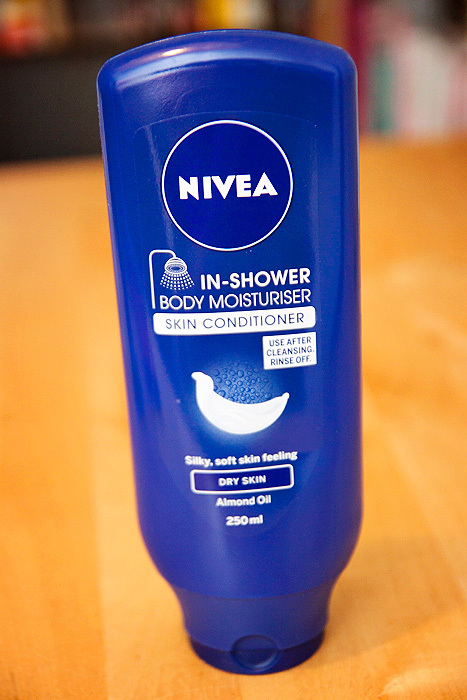 The Nivea In Shower Body Moisturiser is likely to be the most budget-friendly of any in-shower moisturising product you’ll come across this year. They’ve taken a great idea and modified it for the masses. And who doesn’t want a bit of that? But the question is, is it any good? Yes, it’s convenient, saves a bit of time in the mornings and it smells comfortingly Nivea-ish. At £2.56, it’s nice and cheap and comes in sensible packaging that doesn’t skimp on the quantity. It’s a solid offering from a brand that regularly deliver good, no-nonsense bodycare products. But, it’s just not moisturising enough on anything other than a superficial level (unlike the LUSH in-shower moisturiser). When you apply the cream in the shower, it feels exactly like you’re rubbing in hair conditioner…. and you can feel it sitting on the surface of your skin, even after rinsing off. I’m not saying the residue is a bad thing… it’s not. It leaves skin feeling silky-smooth to the touch, even after drying. You’ll likely purr to yourself as you stroke your legs. But that’s as far as the moisturisation goes and as the day wears on, this superficial nourishment doesn’t hang around. If you actually suffer from dry skin, in any way, shape or form… this is unlikely to be hydrating enough for your skin concerns. In the winter, this simply wouldn’t last five-seconds on my scratchy shins. But if you’re heading out for the evening, or simply want to feel all soft and silky for a limited time only… for the price-point, the Nivea option makes for a sound investment. I definitely want to try this, but don’t think it’s going to compare to my love of body butters by the sound of things! Well, in theory it is… they’re both in-shower moisturisers. But they perform very differently, as you would be able to tell from reading my review of the LUSH one (linked in the post) compared to my review of this one. I don’t ‘get’ these. They are an added step in the shower but how is it different or less time consuming than just moisturising after a shower? I bought these but I’m going to have to give them away. I do quite like them but I’ve found that they leave a residue on the bath (no matter how much I try and rinse it away) that turns the bath into an oil slick once it’s dried – and who realistically has time to fully clean their bath after every shower?? Not me anyway! I love in shower body lotions, as I’m lazy in applying lotion. I also think products like this would be perfect in the Summer paired with those razors with the shave gel already in. No shaving cream needed, lotion up in the shower and boom boom your ready for the beach! A FOTD of a different kind.